“The heart of the Karrimor brand has always been in backpacks and backpacking,” says Gary Bardsley, head of Karrimor. Karrimor’s pinnacle backpack piece for 2012 is the Jaguar ST 79 95. The X-Lite category is the range of lightweight backpacks made from the lightest materials suitable for backpacking, climbing-specific, day-walking and running. Karrimor has an Air-Space back system which allows four-way airflow between the back of the pack and the back of the wearer. Karrimor’s latest sponsored athlete, Bonita Norris, became the youngest British woman to summit Everest in 2010, the youngest woman to reach the false summit of Mt Manaslu in the Himalayas in 2009 at the age of 21 and has just completed her latest challenge by reaching the North Pole on a recent expedition. Karrimor is launching into cycling in 2012 with their new Re-feul range with ballistic fabrics, bladders and hydration systems. They also have new developments in their urban and travel ranges. 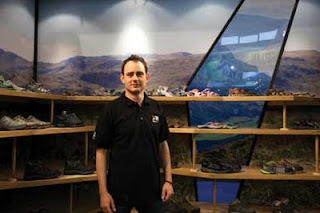 “One of the key areas for Karrimor Footwear is multi-sport,” says Simon Wilkinson, head of Karrimor footwear international. Karrimor has developed a new outsole in conjunction with Vibram for their walking/mid-cut hiking footwear. 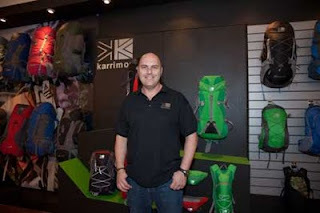 Karrimor reports that they have had a lot of success with their footwear with women’s specific lasts, outsoles and designs.